Bhopal, October 31, 2015 (Muslim Saleem): Chief Minister Mr. Shivraj Singh Chouhan has said that Matru Shakti is supreme in Indian cultures and value system. Money, knowledge and strength – all 3 powers are vested in Matru Shakti . Ram is incomplete without Sita, Shankar without Gauri and Krishna without Radha. Mr. Chouhan addressed distribution function of Swarn Sharda Scholarship 2015 here today. Baba Ramdev, Women and Child Development Minister Mrs. Maya Singh, Energy & Public Relations Minister Mr. Rajendra Shukla and Education Minister Mr. Paras Jain were also present on the occasion. The Chief Minister said that now girls are being considered boon and not bane in Madhya Pradesh. As many as 21 lakh girls have become Ladli Laxmis. Free books, uniforms, cycles are being given for education. Students securing over 85 percent marks in class XII are being provided laptops. Women have 56 percent representation in local bodies. Women have been given 50 percent reservation in education sector and 33 percent in all government services including police. He said that the sate government is giving guarantee against loans being obtained for setting up industries. Exemption on interest is also given. Parents do not have to take loan to marry off daughters since their marriages are solemnized under Mukhyamantri Kanyadan Yojana. He call upon girls to study and move ahead. The government will give them maximum cooperation. Baba Ramdev said that most of income of Patanjali institutions will be spent on education preferably girls’ primary education. Efforts would be made to see that world leaders emerge from Indian soil. He said that no one is big due to race or family. Anyone with determination, vigour and perseverance can journey upto extraordinary from ordinary. He said that country will change through Yoga. Luminaries in the world are practicing Yoga. 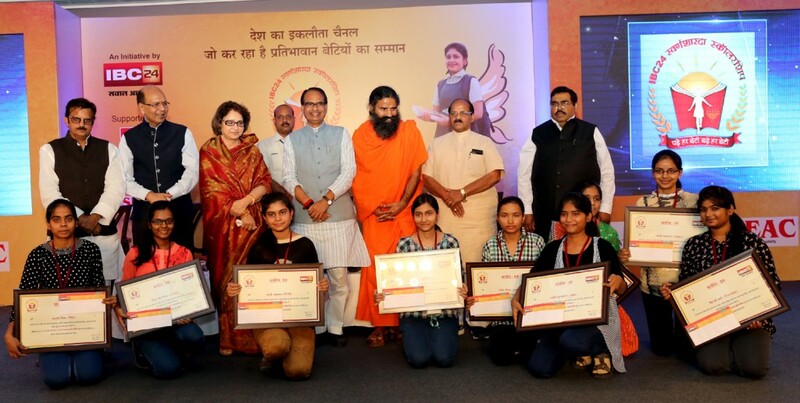 Lauding persona of Chief Minister Mr. Shivraj Singh Chouhan, he said that more schemes for girls empowerment are being implemented in Madhya Pradesh than anywhere else in the world. He said that many Chief Ministers are talked about due to luxury. But Chief Minister Mr. Chouhan is simple and humble. He said that he is the Chief Minister who took lead in saving daughters in the country. Welcome address was delivered by Chairman of IBC-24 Channel Mr. Suresh Goyal. He informed that the channel will give away annual Rs. 50 thousand prize to topper girl students passing class XII Board exam at district level, Rs. one lakh at state level. Cash prize of Rs. one lakh will also be given to girl student getting state scholarship. Channel Head Mr. Abhay Kishore proposed a vote of thanks.